This chart was compiled from section 5D of the 1959, 1966 and 1969 Service Manuals, which lists the bulbs used for all H-D models. The 1959 Service Manual shows 40/35, but the 1966 and 1969 Manuals show 45/35. The C.P. rating of these dashboard lamps does not seem realistic. They have similar C.P. ratings to a tail lamp. Tail lamps need to be seen 100 feet away. Dashboard lamps need to be seen only one foot away. Finding the trade number of the bulb is sometimes easy - if we can find a NOS package, or by finding an existing original bulb on an original bike. But sometimes we have to try and match an existing, available, trade number to the Harley specs. To do this, we're gonna have to learn something about light bulbs. Voltage is pretty easy - most bulbs are rated at a slighly higher value, like 6.4, than the nominal 6 or 12 volts. Amperage, the amount of current the bulb draws, is seldom given anywhere but in formal specifications. Wattage (volts x amps) is the usual specification. 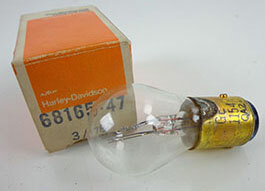 Candlepower is an ancient term that hasn't been used in 50 years, but our Harley books still use it. Base is a description of how the bulb mounts in its socket. Glass is the shape of the glass envelope. And Filament is a description of how the tungsten "heating element" is constructed. 67717-59 4031 6.4 7.03 / 5.47 45 / 35 — G16t PAR46 C6 / C6 Possible Original. 68165-15 63 7 0.63 4.41 3 BA15s G6 C2R Believed Original. 68165-47 1154 6.4 2.59 / .83 16.6 / 5.3 21 / 3 BAY15d S8 C6 / C6 Believed Original. Note: Indexed pins. 68462-49 55 7 .41 2.87 .16 BA9s G4-1/2 C2R Believed Original. 71090-47 44 6.3 .25 1.58 0.9 BA9s T3-1/4 C2R Believed Original. 68165-64 1034 12.8/14 1.8 / .593 23 / 8.3 32 / 4 BAY15d S8 C6 / C6 Believed Original. Note: Indexed Pins. 68462-64 57 14 .24 3.36 .16 BA9s G4-1/2 C2V Possible Original. 71090-64 1815 14 .2 2.8 .11 BA9s T3-1/4 C2V Possible Original.